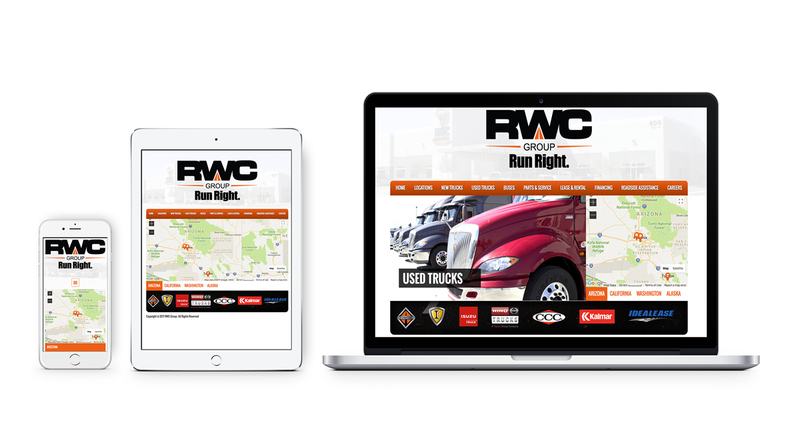 RWC Group is a national truck dealership selling a variety of commercial equipment, parts and services for truck operating companies. They hired us work hand in hand in order to improve marketing collateral and create a powerful online experience for the organization’s stakeholders. The online experience we designed for the dealership was intended to provide users a pleasant and informative way to retrieve information on dealership locations, services, lease information, and a career portal. The end result is a targeted and effective way of bridging the excellent customer service levels offered by RWC staff on location to the website. The layout and typography chosen were chosen specifically to offer great readability and information retention. We focused primarily on creating a unique brand experience coupled with a pragmatic approach to information sharing. In addition to establishing RWC Group’s online image, we were invited to collaborate with a wide range of departments in order to streamline and unify a single brand image across a multitude of campaigns. This task was particularly challenging because of the organizational structure of the dealership, having presence in 4 states, from Alaska all the way to Arizona. Furthermore, we decided to incorporate a plan of finding cost and time savings when it came to designing marketing collateral that could be used in all of the organization’s locations. For example, we worked on campaigns that could be easily altered without too much time input to become local targeted marketing messages based on where the items where being used. Overall, our efforts paid hugely, because the average turnaround for marketing collateral was reduced in a span of 1 year by more than 75%. In addition to creating a powerful brand, we were asked to find ways that the company can streamline its internal ordering and printing process. We worked hand in hand with various departments, from sales, accounting, parts, lease and rental, to not only create marketing collateral, but print and deliver the items on as-needed basis. Over time, we reduced waste and cut costs in unused printed items by focusing on small batch printing using local production facilities. Overall, we were able to not only help RWC Group grow as a powerful brand in its industry, but find ways to contain marketing costs without a decrease in quality. Consequently, we not only helped streamline internal processes, but acted as an in-house marketing team working closely with RWC Group employees.